This tiny miniature is a warm growing member of the Oncidium family. 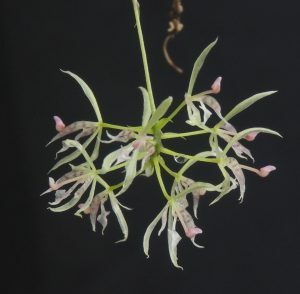 It is native to Peru and Bolivia where it is found as a twig epiphyte in forest from 200-800m. 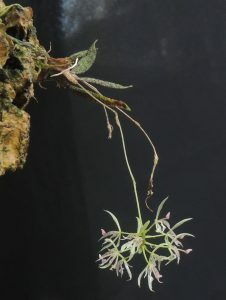 The plant forms a small fan of leaves only 2cm across and then produces a long pendulous flower spike that ends with a bunch of around 8-12 1cm flowers. A very dramatic little species. The plants shown are now 30 months out of flask. 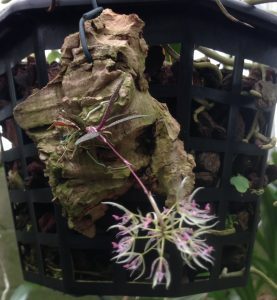 We purchased a bag of seedlings from Peruflora at the 2016 London Orchid Show and mounted the seedlings on small pieces of cork. 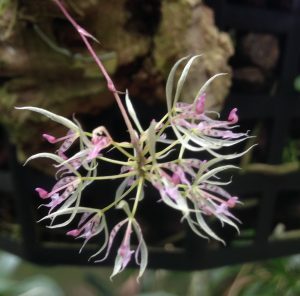 We currently have three of these perfect little miniatures flowering or in spike all hanging in a on a shaded mesh in Warm Asia where they are sprayed once a day. We have looked into the pollination biology of the species and found reports that Macroclinium species are pollinated by Euglossine bees like Gongoras (these are the perfume gathering bees of the tropical Americas) We are still trying to pollinate these flowers to produce some seed to sow and have flowering within three years.